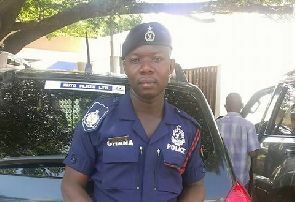 The family of embattled Lance Corporal, Frederick Amanor is pleading with Ghanaians to forgive the officer for severally beating up a woman at Midland Savings and Loans company on Thursday. In a statement copied to citinewsroom.com the family said it had known Frederick Amanor as an amiable person, very caring and considerate,” hence his behavior as captured in the viral video was unusual of him. A horrific video that circulated on social media on Friday showed a middle-aged nursing mother being severely physically assaulted by a uniformed and armed police officer. The officer, Frederick Amanor, hit the woman’s head several times with an umbrella before landing many blows on her head and face. He also dragged her across the floor as the woman tried to resist and fight back. Reports say the incident occurred when the woman insisted on receiving her GH¢270, saved with the financial institution. An official of the company told the woman said they could not give her the money because their system was down but the woman, who had reportedly been chasing her money since Monday refused to leave. According to her, when she refused to leave on Thursday, the staff of the company ordered the police officer to throw her out. Many Ghanaians took to social media to express outrage over the matter, demanding justice for the woman and the arrest of the officer. The Police in a statement said it had begun investigations into the matter and will ensure justice for the victim and the perpetrator sanctioned. The management of Midland Savings and Loans has since condemned the assault. But the family of the beleaguered Police has also issued a statement appealing to the Inspector General of the Police, and the victim, Patience Osafo to forgive the officer for the dastardly act.